Shooting Star House, the Hampton hospice has welcomed a wonderful refurbishment in the dining and lounge area, all courtesy of workplace design and fit-out specialists Area, part of long-time corporate supporters, Fourfont Group. An army of 80 staff from across the group, as well as sub-contractors, invested their time and expertise to give the communal area a much needed facelift. The team of volunteers helped to build, decorate and clean over the course of a fast track two-week programme to ensure the new space was operational as soon as possible. The design was specially created to ensure it was not only a bright and exciting space, but also comfortable and practical, as many of the supported children, suffer from very complex needs and conditions. The space has been transformed into a fun and exciting environment, with magical trees, moving hot air balloons and clouds. 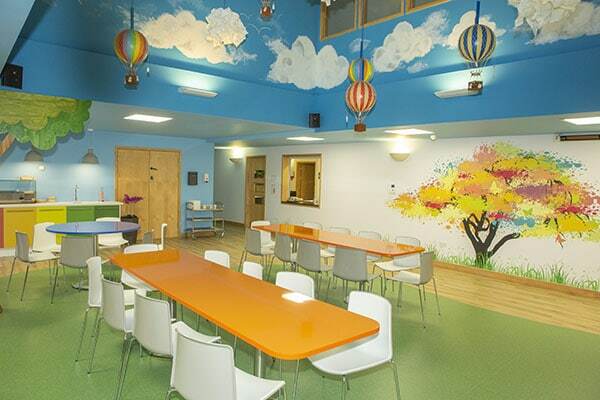 There are vibrant dining tables and a rainbow coloured breakfast bar so families and staff can enjoy meals together. A special display area has been created where artwork can be shown, as well as comfortable sofas for families to use when they come to visit.